With T-shirt weather in full swing, locals and visitors are always on the look out for cooling pit stops in summertime Richmond. But while air-conditioned malls, breezy shoreline parks, and ice-cold dessert cafes are popular, it’s also worth diving into what may be North America’s tastiest bubble tea scene. The first local cafes specializing in bubble tea and its many associated varieties began popping up in Richmond a couple of decades ago. But the Asian-driven scene has become far richer and more innovative in recent years, with homegrown independents and imported franchises from Taiwan and beyond popping up on city streets. Richmondites typically have their favourites but there’s always a new spot to try just around the next corner. And for visitors, it’s a fun—and thirst-quenching—scene to explore. Read on for five intriguing bubble tea flavours to try here this summer, and look out for them on your travels around the city. It’s probably the best $4-to-$7 cool-down you’ll find anywhere. If you’re a bubble tea virgin, Chatime on restaurant-packed Alexandra Street (aka Food Street) is perfect for first-timers. The wall alongside the counter displays a list of 10 favourite flavours, helping you navigate the multitudinous options on the main menu. There’s also a graphic how-to guide to ordering, explaining the choices you have for ice-level, sweetness, and additions (from pearls to red bean to coconut jelly). 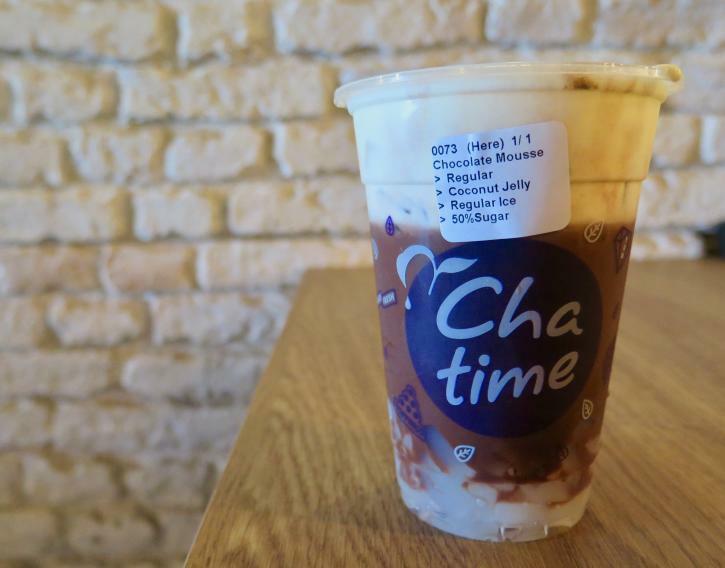 The Chatime staffers are also super-friendly and they’ll help you make the right choices. Check out their ever-changing flavour of the month—strawberry cheesecake on our visit—and, if you’re an incurable chocolate fan, try the rich and velvety Chocolate Mousse Tea. It has a creamy, thick-shake consistency (coconut jelly recommended) that might just have you ordering another one before you leave. One of the world’s biggest bubble tea chains (with upwards of 3,000 stores), CoCo Fresh has two outlets in Richmond—including their newest in the Continental Shopping Centre. With an interior colour scheme swathed in orange accents and shiny white tiles—not to mention their enigmatic mascot—check out the screens above the counter for your choice of everything from Bubble GaGa to Red Bean Macha Milk Tea. But the 3 Guys—available here and at the Blundell Centre branch—is one of their most beloved milk tea staples. Rich, refreshing and satisfyingly creamy, it’s a winning combination of pudding, chewy tapioca, and soft grass jelly. Want to skip the grass jelly? This beverage also comes in a 2 Ladies version, made with tapioca and pudding only. A popular import with locations around the world, you can check out the wall map and see their first Shanghai store opened in 2006 with later stores opening in London, San Francisco and beyond. Famous for its winking lemon mascot (you can buy merchandise with her lemony face on it here), this funky little café is across from the Canada Line&apos;s Richmond-Brighouse Station, which means it’s often busy with locals grabbing a cool drink on their way home. Favourites here include Oreo Tea and Lemon Kumquat Tea, but it’s the Salted Cheese range that has become its undoubted signature. Tasting far better than it sounds, the Black Tea Salted Cheese looks, at first, like a malty brown beer with a creamy head. But after stirring, it becomes a silky smooth blended treat with a creamy viscosity. Any salt or cheese notes are extremely subtle and the tea and creamy sweetness dominate. With its exposed brick accents, chic wood floors and counters, and retro-look sofa area at the back of its slender store, Tea Monarch has a more sophisticated, hipster-driven feel than many of Richmond’s cute bubble tea joints. Which doesn’t mean they don’t have a highly visual mascot here as well: check out the magisterial lion logo that’s painted on the back wall and also emblazoned on the cups here. But being cool isn’t just about how you look. Menu-wise, Tea Monarch covers everything from Oolong Roast Milk Tea to Four Season Pouchong Milk Tea. But for something a little different, check out their Winter Melon Roast Milk Tea. The winter melon fruit adds a crisp, refreshing lift to this creamy drink—which makes it the perfect accompaniment to a hot sunny day in the city. TTOB stands for “The Tea of Brightness,” which explains why this colourful and friendly Taiwanese joint—with its own toy-lined play area for kids—is so inviting. But while they also serve fresh-made bubble waffles here (Mango Madness recommended), it’s the beverages that keep regulars coming back for a sought-after table. And when one of your slogans is “Enjoy Life Enjoy Tea,” it’s hard not to try one when you’re in the area. For those thirsty visitors who love both tea AND cats, there’s really only one option here. The caramelly Princess Kitten Milk Tea comes with a tiny marshmallow model of a whiskered white feline, which bobbles in the top of your frothy drink as if its reclining in a very sudsy Jacuzzi. It’s the kind of fun addition that makes this drink arguably the most photo-ready beverage in the city.